The minute seasons change from winter to summer, the blankets that have served us so well are folded and stuffed into cupboards. Here they’ll remain until winter comes around again. Does this not seem like an awful waste of something beautiful you’ve spent money on? To only use it for half of the year, or sometimes even less? Why don’t you rather keep your blankets out and find other ways to use them? Blankets can be used around the home to change up the décor. Add colour to a neutral living room with a bright blanket. In summer, cool blues and greens could work really well, with the blanket draped over the back of a sofa. Cascade the blanket over the sofa’s seat, all the way to the floor, and the blanket transforms into a cosy slip cover. For a modern touch in a lounge, fold a light blanket neatly in half or thirds and lay it down the back of a chair and on the seat. The addition of a scatter cushion in a contrasting colour will enhance the look. Readers, or anyone with a selection of coffee table books, can lay a folded blanket across a coffee table and then put books on top of it. It’s an interesting décor touch that visitors are sure to notice. Big blankets can be put on a rod and hung behind a bed as a headboard. Already have a headboard? 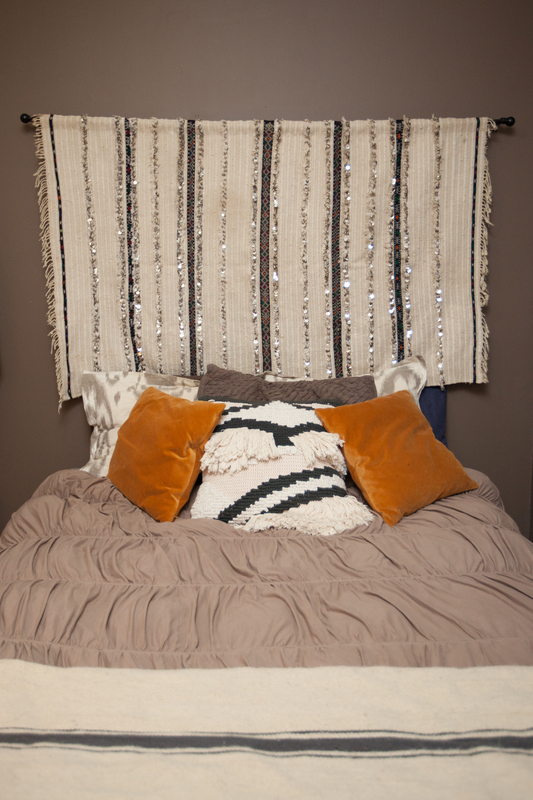 Then fold a blanket in half and drape it over the headboard to update its look. It will also refresh the look of the bedroom instantly and at no cost. If there is a chaise lounge in the room, fold a thin blanket lengthwise, then in half, and angle it on the corner of the edge of the cushion. Other chairs can be decorated by laying a blanket over the arm of the chair. Imagine a cloth napkin over a waiters arm and you’ve got this look. The basic way to decorate with a blanket in the bedroom, is to fold it in thirds before placing it close to the bottom of the bed. Use two blankets, one folded wider than the other and place at the bottom, for an extra cosy look. Create a focal point in a hallway by putting a chair with two or three thin blankets on it in a corner. It’ll double up as clever storage space for some of your blankets and keep a little warmth close by for when it’s needed. Finally, let’s not forget that blankets also make magnificent forts. The kids will be entertained for hours! It’s a win-win situation, because you’ll finally have time to page through that new coffee table book. Next post: How Does Lender’s Mortgage Insurance Work?